It is like the mother of all luxury SUVs. Lexus RX 350 almost taught the world about luxury SUVs. A vehicle that had it all! Comfortable and plash interiors, a ride to savor, sturdy and strong exteriors mated with an affordable price, ability to traverse though rough weathers and terrains and a generous amount of room for passengers as well as for cargo. As soon as the first Lexus rolled out creating a whole new niche of vehicle, disciples followed. And while there is a plethora of competitors, some of which grown into better vehicles than the Lexus itself, this brand and its lineup stands firm on the grounds as one of the most appealing luxury SUVs in the world. And one such crossover happens to be the 2014 Lexus Rx 350. The 2014 Lexus RX 350 is all what a Lexus should essentially have. And along with it sports an impressive V6 grunt, comfortable and spacious seating and a plush cabin that is fully equipped with cutting edge technology. The five passenger crossover offers all sorts of basic features that anybody could possible need from a vehicle in this segment. Topping it all is an almost negligible amount of limitations about the Lexus RX 350. Jus an absent third row for seating and a little tricky user interface on the cabin and that’s all that is not exceptionally good about the Lexus RX 350. Everything else is! 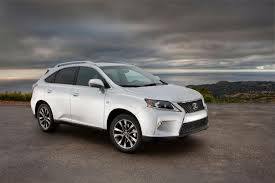 The 2014 Lexus RX 350 gets its power from the 3.5 liter six-cylinder engine that is good for 270 horses and about 248 pound feet of twist. The 2014 RX 350 comes standard with a front wheel drive and a six speed automatic transmission. Also, an all wheel drive system comes as an option. The trim level F Sport comes standard with all wheel drive and has its engine mated to an eight speed automatic instead of six. This fine ride is capable of cruising up at 60 mph starting from rest in a sprint time of 7.1 seconds – on par with the performances of other vehicles in this niche. The one little attribute where the 2014 Lexus RX 350 fails to impress is its towing capability. The luxury crossover can tow around 3,500 pounds whereas, other crossovers in the segment can manage to tow more. While the cabin is a bit messy to operate and requires more attention than need be, it looks amazingly plush. The interiors of the Lexus RX 350 look absolutely divine and every little addition on the inside of this vehicle adds to the luxury, the vehicle promises to offer. The 2014 Lexus Rx 350 rides like a star. When you drive and RX 350, all you can witness is the luxurious and comfortable ride and isolation from the rest of the world and its noises. Although this crossover faces quite some amount of competition from newer competitors like the Acura MDX and the Audi Q5, the 2014 Lexus RX 350 is one classic luxury crossover one mustn’t miss to check out!